There has been a lot of noise and confusion lately about the deterioration of credit performance in the marketplace lending industry. It’s natural to wonder whether this might be a local phenomenon, or more of an industry-wide issue. With more than 28,000 loans originated on the Upstart platform, we want to assure you that we’ve seen no degradation in credit performance. 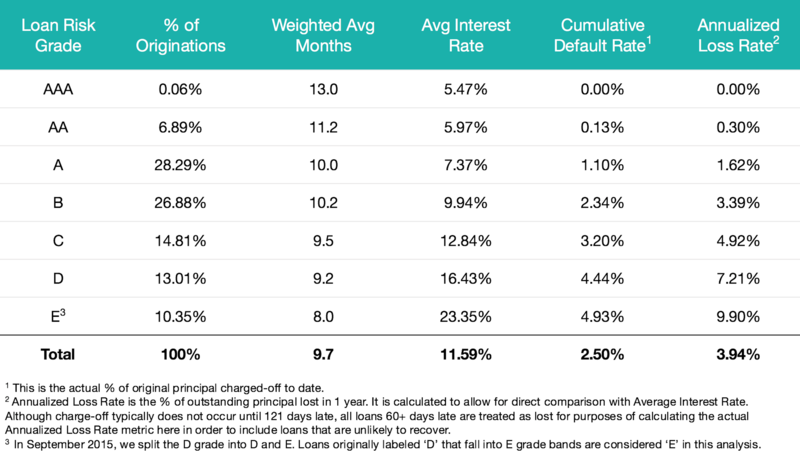 In fact, in the 2 years since originating the first Upstart loan, the portfolio has experienced low loss rates relative to the average interest rate across every loan grade. Furthermore, because our model constantly improves and learns from the data, performance has improved across cohorts, and we expect recent originations to continue that trend. The following table shows the performance of Upstart’s 2014 and 2015 vintages for 3 year loans, measured as of April 21, 2016. While we can’t guarantee that future performance will match that of the past, it’s our firm belief that credit underwriting focused entirely on the FICO score and credit report is inherently limited, and that our approach to developing a broader understanding of the borrower leads to better credit decisions. Additionally, our policy of 100% verification of borrower income and education gives us confidence that the data used in our credit decisioning is accurate. We’re excited about the gains we’ve made over the past 2 years and look forward to expanding our portfolio further in intelligent and sustainable ways.